Beagle Point marks the end point of a galaxy-spanning expedition undertaken by Commander Kamzel in 3301. At the time, the system was known as Ceeckia ZQ-L c24-0, but Kamzel nicknamed it Beagle Point after his beloved beagle Jack, who had passed away a short time before. One year later, the system was chosen as the final destination of the first Distant Worlds expedition, resulting in an influx of over 500 pilots in April 3302. In recognition of these events, Universal Cartographics officially renamed the system Beagle Point on the 26th of May 3302. This system was visited for the first time on EDSM by Erimus Kamzel. 2003 ships passed through Beagle Point space, including 109 ships in the last 7 days. 39 ships passed through Beagle Point space in the last 24 hours. Beagle Point, one of the most distant star systems currently surveyed at 65,279 LYs from Sol. This system marked the end of the line for CMDR 'Erimus' Kamzel's Distant Suns extreme-range survey mission during the very early days of deep space exploration (Dec. 3300 - Jan. 3301), and marked the first recorded galactic crossing (culminating in mid-January 3301). Unofficially nick-named 'Beagle Point' at the time by the exploration community after Kamzel's intrepid starship that first discovered it (DSS Beagle*), the system has subsequently become a point of interest that has been visited by many explorers conducting their own survey missions of the galactic outer rim regions. One year after the Distant Suns expedition, the Beagle Point star system was chosen as the final Distant Worlds basecamp, which saw the arrival of over 500 pilots during early April 3302. The Distant Worlds fleet, originally 1,300 strong, were tasked to map out the first galactic highway from Pallaeni to Beagle Point, a 81,500 LY route stretching through the galactic core, across the Aphelion regions, through the Abyss and the Solitude Void, and finally to the Ceeckia sector in which Beagle Point is situated. Despite its remote location, Beagle Point thus became the center of several social events organized by the exploration community, including SRV rallys and air shows. Also within the system are three other community-named worlds; Randles Rest (P6) - named in memory of a deceased friend of CMDR Patrecleus of the Distant Worlds 3302 Expedition, Maile's Landing (P7) - named in memory of CMDR Tumor, who passed away during the same expedition, and Tara (P8) - CMDR Tumor's wife. In recognition of this star systems historic importance, Ceeckia ZQ-L c24-0 was officially designated "Beagle Point" by Universal Cartographics (Frontier Developments) on May 26th 3302. Why Beagle Point? Beagle Point was pretty much the furthest system an explorer could reach prior to the Anaconda era (Nov. 3300 - Jan 3301) - a period when explorers were flying Cobras and Asps. It was the last system reachable during the first galactic crossing (culminating in mid-Jan 3301). When Universal Cartographics increased exploration payouts in late January 3301 and introduced the 1,000 LY plotter, Anacondas became more affordable and within weeks were the ship of choice for a lot of deep space explorers - thus making the systems beyond the initial 35 LY max jump ranges reachable. As a consequence Beagle Point's significance and historical background for being the furthest reachable star system no longer applied and it instead became more noted for being the final system of the first Galactic Crossing during a short period when Asp Explorers reigned and no 1,000 LY route plotter was available to help chart a path to it, or the stars beyond. 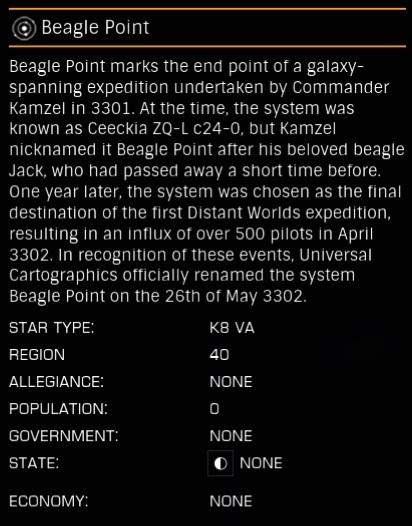 *OOC: The DSS Beagle was named in honour of Kamzel's pet Beagle (Jack), who passed away just prior to the Distant Suns Expedition. These systems were surveyed by the Rock Rats during the Distant Worlds Expedition of 3302. One of the aims of the expedition was to establish a galactic highway of jumponium-rich systems (source).